EXCELLENT GUIDE! He picked us up on time and the van was nice and in very good conditions. Very attentive, kind and focuses on many details to make sure that the customers have a great experience. He has a lot of knowledge on the temples, history, and fun & interesting facts. Other than being a great guide, he is an AMAZING photographer!! 100% recommended! Sopheak is once of the most knowledgeable, friendly and helpful guides we have ever used. We cannot recommend him highly enough. Visiting Ankor Wat today we were very happy that we chose to have Sopheak as our private guide. He arrived promptly and we felt very safe driving with him. He is friendly and considerate, speaks very good English and has a wealth of knowledge to impart. I would highly recommend having Sopheak as your private guide and driver. It was a pleasure doing the tour with Sopheak. He was very considerate, and adjusted the tour in a perfect way. Highly recommended! Sopheak was exactly what I was looking for in a guide. He had a suggested itinerary but was extremely flexible with my requests for slight deviations. I was travelling alone and felt completely comfortable for the full two days. He also took a massive amount of photos which turned out excellent. Plenty of documentation of wonderful memories! I'd highly recommend him! Very friendly, very knowledgeable, helpful. Sopheak made my time in Cambodia better than it would have been had I not booked this tour with him. I can't recommend him enough, definitely book a tour with him. Sopheak was fantastic! We had a very enjoyable day seeing the sights of Angkor Wat. His English is very, very good and he gave us many interesting facts, not just about the Temples we were seeing, but also about Cambodia and the town of Angkor itself. Fascinating stuff. Highly recommend taking tours with Sopheak! The best tour guide in Siem Reap. He was very knowledgeable. We avoided crowds and lines with his expertise. He was very accommodating and changed his plan according to our needs. He knew his customers very well and had drinks ready after a long day of walking. He went above and beyond what was expected of him. His pride in his country is evident and it was reflected his answers to our questions. We highly recommend him. We had BEST experience with Sopheak. He was professional, kind and knowledgeable. He piluxurious air conditioned SUV. He provided complimentary ice cold water (and beer). Sopheak knows not just the history of the various temples and culture but also the best photo and viewing locations. He takes incredible pictures that we will treasure and it looked as if we were the only ones there!!! He also will take you off the beaten path and we saw a few temples where we were the only ones. He is the guide to have! The guide was knowledgeable, friendly, responsive to our needs and a pleasure to spend the day with. This was an amazing day! Hi Sopheak, I'm a bit late in sending a shout out, but thank you so much for the tours in Siem Reap. You were a fantastic tour guide and you made our trip so much more enjoyable. Hope you're doing well. If anyone is looking for a local tour guide who know's their stuff in Siem Reap...this is your guy. Steve. Sopheak was just great! He was friendly and polite. His English skills are very good. He knew all of the great photo spots. He promptly returned emails and was flexible and willing to change the agenda when my scheduled changed. If I ever return to Cambodia, I will want him to be my guide!! A very soft spoken, knowledgeable tour guide that makes our trip all more interesting and comfortable. Sopheak has great sight for photos. He knows where all the good spots are. Thank you for the experience we had. Sopheak was great! We booked a day before and the only real instructions we gave were that we wanted to see temples and avoid crowds and we did just that! Our experience perfect. Sopheak is very knowledgeable, friendly, easy to talk to, and funny! We were sad when the our tour was over as we sincerely enjoyed spending time with him! Siem Reap is a beautiful city to explore, but if you have limited time, don't do it on your own and hire a local guide to take around like Sopheak, our tour guide, who not only knows everything about his hometown and temples in Angkor city but also is a great, fun and outgoing guy. Sopheak was always on time on our two days tour, very professional and knowledgeable. He provided cold water for us and took many amazing pictures of us. I promise you won't be disappointed, book him if you are in Cambodia. Sopheak did a wonderful job explaining everything and answering all the many questions we asked. He took pictures for us and went out of his way to make us feel welcome. We booked Sopheak For 2 1/2 days in Siem Reap. We visited the floating village with a private boat, the waterfall in the mountain and of course the temples! His car was clean and comfortable. Sopeheak knew all the best photo spots, was knowledgeable about the history and took good care of us. Above all, he was a pleasure to be around, with a kind spirit and a good sense of humor. You will be lucky to tour with Sopheak, we have wonderful memories. Sopheak is a great tour guide, he always looks to satisfy what his guests are looking for, depending on their interests. He is funny and easygoing, and the best part, he also is a great photographer, if you are looking for awesome pics of you and your party. He has a very fluent English, which helps you to have a good conversation with him. Please don't hesitate and book him, you will not have any regrets. Sopheak was a great guide. He is thoughtful and pleasant to be with. He knows all the right spots for pictures abd even helped us with both a luggage issue and a problem at our hotel. Hire him if in Cambodia! A great day out and swimming under the waterfall was fantastic. We were a family of four and it was a very varied trip. I highly recommend this tour. I mistakenly didn't have an Angkor Wat pass whilst on this tour, so we were not able to go on the better roads around the temples. Today Sopheak looked after us really well. Nothing was too much trouble. He has a great sense of humour and is really friendly. His car was clean and comfortable and he drives very safely which is important to us. We would have no hesitation in recommending Sopheak as your English speaking guide. Sopheak is an amazing guide. He is knowledgeable about his tours and he is always willing to answer questions. He went above and beyond for our tours. He made our trip to Cambodia an experience that we will never forget. I would not hesitate to pick him as a guide if we decide to go back to Cambodia. Sopheak and I had a 12 days tour and everything went smoothly. Sopheak managed the schedule agreed upon very professionally and all the goals were accomplished. Sopheak was very knowledgeable about the history and details of the places we visited and could explain them in very good English. I can therefore 100% and unrestrictedly recommend Sopheak as a tour guide for language, knowledge, personality, organization, honesty, punctuality, logistics, driving and for fulfilling agreements down to the letter. Sopheak arrived to collect us on time and we were very much at ease with him from the start. He has good language skills and answered all our questions clearly. He made the tour around the floating village very interesting and we loved spending time with him. An excellent tour guide. Sopheak took us to a locals only market which was fascinating. We were not brave enough to try the insects but had a wonderful bowl of noodles with local flavours. 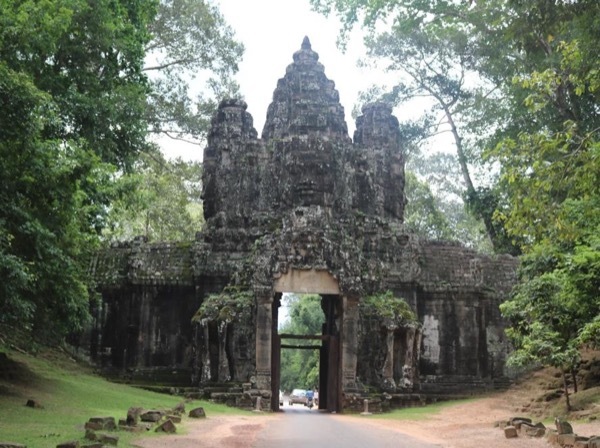 Sopheak understood that we wanted to see Siem Reap's real life and this tour certainly gave this. Once again Sopheak was excellent. Sopheak was an absolutely wonderful tour guide - knowledgeable, great communication and English language skills, very patient, and just a likeable guy all around. Highly recommended!!! I think it's much better to spend a little bit more on a personal tour guide because you can suit your itinerary to meet your needs and time. And always support the local tour guides, they are far better than those from the big tour agencies. Will come back for more tours with Sopheak, he's truly awesome! Our guide, Sopheak was amazing.... We had the guide for 12hours and we got cold water all day, good air con, let my wife sleep in the car with the engine on when she got tired while we took photos. He was polite, helpful and everything we could of asked for in a guide. Thank you so very much, we really enjoyed our time with you exploring this wondrous place. Angkor Wat is incredible!!!!!! Sopheak, our guide, was knowledgeable, pleasant and made every effort to make the tour as interesting and pleasurable as possible. The guide had exceptional customer service skills. He was polite, kind and informative. He had great knowledge of the temples. There wee tear personal touches and local visits. Thank you so much. Sopheak and Sara are a great guiding team. Both of them are very knowledgeable and easy to learn from. The history of Angkor Wat and the main temples were very well explained. The best of all was their service, they even picked us up at the airport with no extra charge (though we tipped them for this extra service). We really appreciate and recommend this tour guide team. The most exciting Christmas day I've ever had. Sopheak Hun was my guide for the journey to Cambodia's holy mountain, Phnom Kulen. He is very intelligent and easy to talk to, and I have a far deeper understanding of Cambodian culture and history because of him. This is an experience I will remember vividly for the rest of my life. Thank you Sopheak! Another wonderful day with Sopheak! A magical place with the waterfall and temple. A remarkable experience that we will never ever forget! Sopheak is a very knowledgeable, friendly, helpful, kind and fun tour guide. He answered all of our questions with ease. He is very fluent in English and found him to be very, very nice and we feel very safe to be with him. He even bought us lotus flowers to be able to taste lotus seeds. My first experiece to taste fresh lotus seeds. I highly recommend him for your travel to Siem Reap for your visit to Cambodia. Will tell my friends about him when I go back to United States. TOUR GUIDE RESPONSE: Thank you for your view me. I am much appreciate and wishing you happiness and good health:). Our group of 4 spent 3 days with Sopheak. We had an amazing time. Sopheak is very knowledgeable, funny and really enjoyable to be around. We got a tour guide and photographer as he took a lot of our photos for us. Sopheak knew how to avoid the crowds at the temples and the best local restaurants. We had so much fun and wished we could have stayed longer. We can highly recommend Sopheak as your tour guide in Siem Reap, you won't regret it. Absolute highlight of our trip! Sopheak and his business partner (and lifelong friend) Young were wonderful guides. Sopheak is the driver and Young the guide. Together they made our two days in Siem Reap a wonderful experience. The history here is deep and complex, and Young was knowledgeable, thoughtful and thorough in sharing it with us. I highly recommend them. We thoroughly enjoyed our time with them and our time in Siem Reap. excellent tour and totally worth doing. The bugs are very tasty and quite and experience. Sopheak is an excellent tour guide and is very fun to be around. The second day in a row that we went on a daytrip with Yong as our guide (day before we went visited the Angkor temples). Very nice trip, where we were able to get to see the way of living around Tonle Sap. Again a great experience where we again enjoyed the knowledge, skills and way of doing of Yong. Also this day trip is highly recommended. TOUR GUIDE RESPONSE: Thank you so much for your value comment We are much appreciate and wishing you and your family good luck and have a nice holiday back home. We had a fantastic day with Yong as our guide. Yong is very skillful and really knows everything about history and context. Also, he was very nice in interacting with our children. Highly recommended. TOUR GUIDE RESPONSE: Thank you so much for your value comment. We wishing you and family go luck and have a fantastic holiday while visit in our historical site. Excellent tour with a outstanding guide. Yong was very knowledgable about history and guided us very well through the three temples we were visiting. He is also a very friendly person who likes to interact with his tourists. I can definitely highly recommend him. TOUR GUIDE RESPONSE: Dear Adrian Kaerle , Thank you very much for your value comment our service during your visiting in siem reap. we are much appreciate and wishing you and your family have a wonderful trip with prosperity and happiness. We had a great time with Sopheak. He is very motiviated and very well prepared. show us Siem Reap, talk to us about the history of Cambodia and the recent events. I recommend his tour 100%. Friendly and helpful guide. Knowledgable about Siem Reap and willing to take into account my young children as well as elderly mother when touring. Highly recommended. Good driver and a excellent tour guide. Very knowledgeable guide with very good English. Fantastic tour of floating villages and Tonle Sap Lake. A highly recommend this tour to everybody visiting Siem Reap. Sophek was my guide. Very professional, knowledgeable and courteous. Very knowledgeable and informative. Thank you as we all had a fun and enriching experience. Sopheak, who served as our driver, and his brother in-law, a licensed temple guide did a great job guiding my wife and I in Siem Reap for a 2 day tour of Angkor Wat, Angkor Thom, Ta Prohm, and the Floating Village at Tonle sap Lake, to name a few. Both guides were personable with a good sense of humor, flexible, prompt, knowledgeable, and attentive to our needs with cold water and a towel. Lunches at pre-arranged stops were excellent. We would like to thank them both for an outstanding job. Had a great time with Sopheak, toured Angkor Wat, Angkor Thom, and Ta Prohm. Another temple was available but I was just too out of shape and had to beg off. Enjoyed some Amok at a great table for lunch. Sopheak was always ready for me with a cold water and towel when we got back to the vehicle, very thoughtful and helpful. Had a great time and will be looking him up when I can get back. A little confusion at the airport but nothing serious. Turned out we got Sopheak and his brother as driver and guide. We only had one day but they made the most of it. Great knowledge of Cambodian history, ancient and modern.